I’ve a funny story to share with all of you. Or wait, I think the right word should be …… Frustratingly-funny story. You see, Buntong in Ipoh consists of a predominantly Indian community (and to a certain extent; Chinese as well), famous for all sorts of cheap and delicious hawker fare, notably the famous Buntong Beef Noodles (here’s a branch in Ipoh Garden South), Kacang Putih from Kampung Kacang Putih in Buntong (HERE’s one of the outlet selling freshly fried Kacang Putih from home), and even Ipoh’s outstanding Nga Choy Kai (Ayam Tauge or Poached Chicken served with Bean Sprouts & Flat Rice Noodles). Deep in thought, and hands in perpetual chopping mode ….. 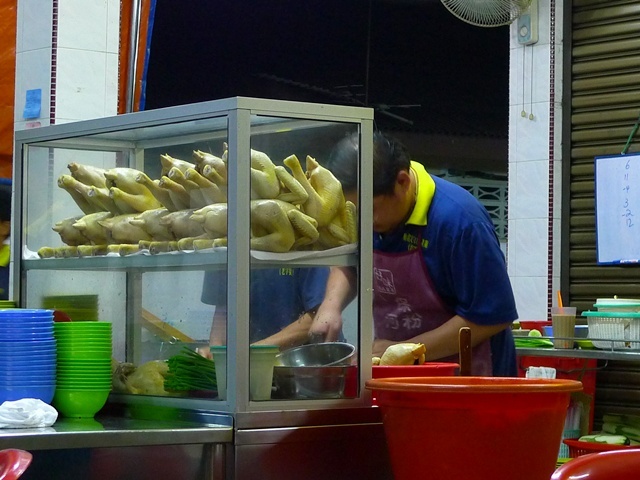 But the one dish, that made Buntong stood out (and still does, in fact), is the Buntong Wan Tan Mee. Yup, coined as the ‘heaviest’ meal in the world (not calorie-wise, but the ‘One Tonne’ moniker), Buntong’s Wan Tan Mee has been living its legacy for many years now, and recently moving back into its own premise, renovated and spanking new, but still on the same road. Jalan Sekolah in Buntong. The name of the shop (or rather, stall, as it has always been affectionately known as) is Cheong Kee. Though I doubt the wan tan mee at Cheong Kee has garnered enough attention and limelight in comparison to Ipoh’s Nga Choy Kai, Dim Sum, or even Chee Cheong Fun. To cut a long story short, I went not once, not twice but THREE times; on different days of the week, and yet failed to sample the legendary homemade egg noodles with slivers of barbecued pork (Char Siew) and dumplings (Wan Tan). Tough luck …. First visit the shop was closed. Second visit was slightly better, as Cheong Kee was preparing for its erm … RE-opening ceremony on the following day, after moving into the newly renovated premise. Okay ….. so third time’s the charm they say? 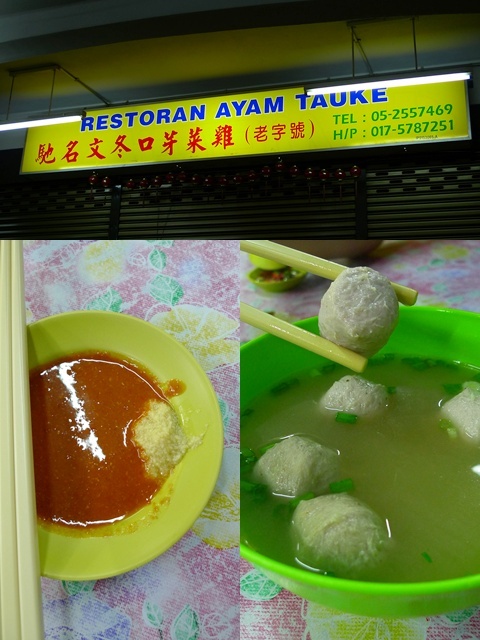 Restoran Ayam TAUKE?! Not typo, but definitely easier to remember compared to Ayam Tauge …. is it not? And there you have it. 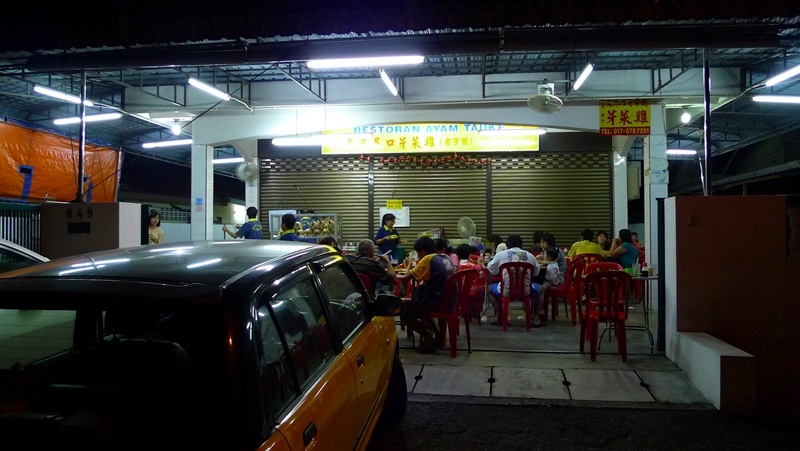 My pathetic wan tan mee hunt in Buntong. Faltered miserably, I might as well get their number the next time. But wait, I can’t do that when they’re NOT EVEN OPENED, right?! Geez ……. So on two of those occassions, I seeked solace in the forms of back up plans. First being the rather famous Ayam Tauge/Nga Choy Kai at Restoran Ayam Tauke (hehe, Chicken Boss? ), on Jalan Guntong in Buntong. Location map to come later at the end of the post. 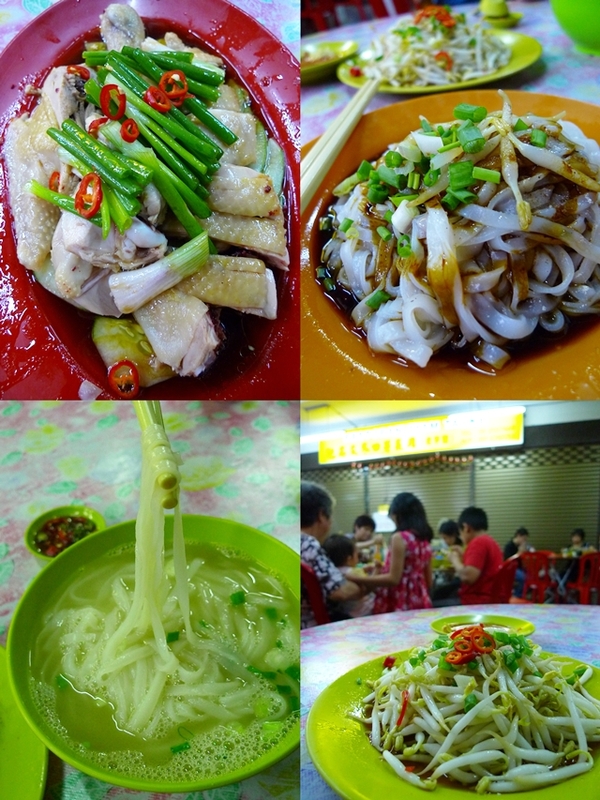 Smooth & VERY oily poached chicken, Hor Fun (smooth, flat rice noodles – an Ipoh specialty) in both soup and dry forms, and the crunchy & fat bean sprouts. Typical Nga Choy Kai meals in Ipoh consist of 3 items. The chicken (poached, NOT roasted nor grilled), blanched bean sprouts (the Tauge), and the slithering-down-one’s-throat-with-ease Hor Fun (flat rice noodles). They said it’s the water from the limestone hills of Ipoh that ‘fattens’ the bean sprouts, and resulted in unbelievably smooth Hor Fun (or Kuey Teow, as it’s commonly known in other states). Myth or fact? Aside from the greasier than desired chicken (no thanks to liberal dashing of sesame oil), and the not-so-fat bean sprouts (used to the plump, juicy and crunchy ones from elsewhere), the meal was decent, at best. The Dry Hor Fun which was tossed with soy sauce, dark soy sauce and some sesame oil fared much better than the soup version. As I find the soup rather bland, instead of the usual sweet and flavourful version, from the chicken stock/bones/whatever-else used in boiling the clear broth. Notice the restaurant is anything but one. You’re actually dining in the compound of someone’s house. Hahahah ….. So what? Or not. OK, OK …. in that case, walk your stoned arse over to ANOTHER house next to the Nga Choy Kai, for some even cheaper, pedestrian food. The omnipresent, ever reliable, Liew Fun stall, also operating from a house. Guess the cheaper operating cost got people opening up restaurants, eateries and whatnots right smack inside their houses’ compounds, huh?! The almost made for each other combination of noodles and “Liew”. What’s a “liew” you ask? It’s Yong Tau Foo, or Stuffed Fish Paste. Don’t look down on this unassuming outlet. The throngs of people patronizing this stall piqued our interests, and we waltzed in after the initial disappointment of failed Buntong wan tan mee hunt. You first walk over to the counter (or stall) where they’re preparing the noodles and sides almost clock-work like, and pick your favourite pieces ‘Liew’. Then choose a noodle of your choice, and the way you want it to be cooked, either in soup, dry, or in curry. They even serve Laksa on Fridays, Saturdays and Sundays only. Hearty serving of Buntong Beef Noodles @ RM4.30. Take note that when the crowd swells to its full capacity, the wait for your food may get tedious. My advice? Order some fried Liew, which requires no preparation. And munch/nibble/swallow/throw them at unexpecting customers or staff to vent your frustration. The pieces of “Liew” were nothing spectacular, pale in comparison to the almighty Big Tree Foot @ Pasir Pinji, or even the astonishingly endless varieties at Kwong Hong in Gunung Rapat. The beef noodles came in a rather big portion, with generous servings of tender beef, offals, and soft radish. The broth did not pack a punch as I preferred, bordering on being rather bland, but filled up the tummy rather well. 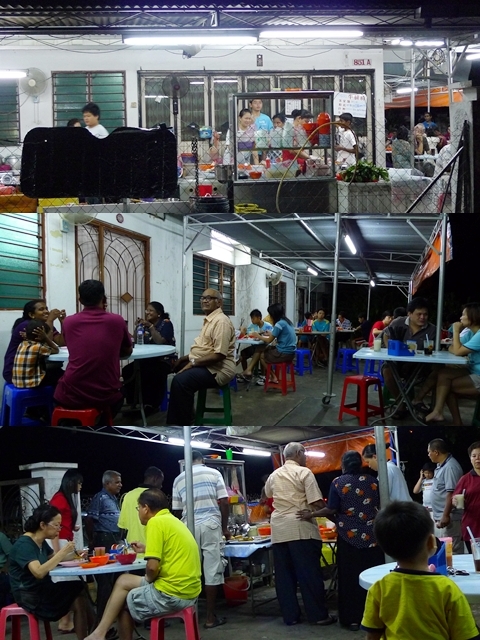 Location : Restoran Ayam Tauke @ No 849, Jalan Guntong, Buntong, Ipoh, Perak. Tel No : 05-255 7469 or 017-5787251. Closed on Tuesdays. Opens only in the evening. Location : Liew Fun Stall @ No 851A, Jalan Guntong, Buntong, Ipoh, Perak. Closed on Wednesdays. Opens from 7-10pm. Here’s a Google MAP to both the places. Realise that both places are within walking distance from each other. 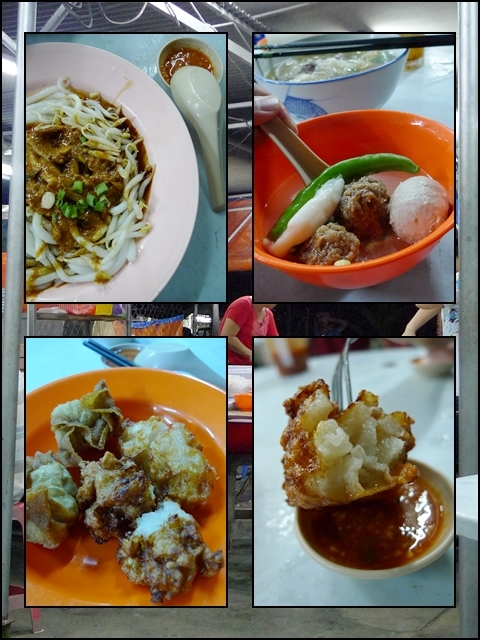 If you like beef noodles and fried Sar Kok Liew or anything fried, you must try Restoran Desa Rishah in Falim. Really good. 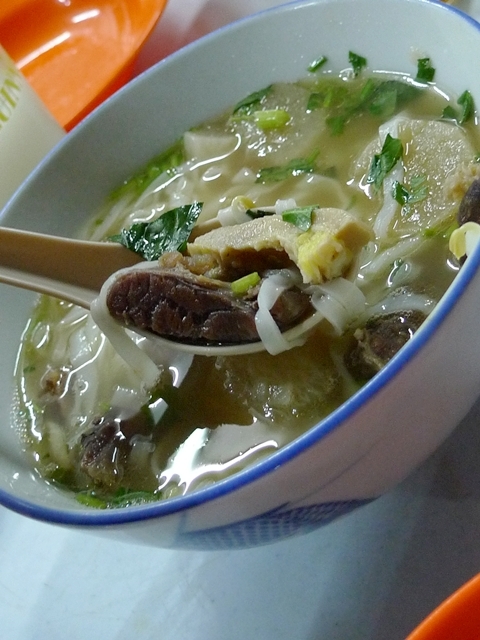 i like Ipoh hor fun soup- perfect with chicken or liew. gosh. I love poached chicken with soy sauce! call me weird, but i'm not a bean sprout lover, esp those fat ones!! ahh!! When I left Buntong, I was only 8. I'm 42 now. Gee, it's nice to read about this little village, and indeed it brings back bitter and sweet memories.I don't remember many Indian families then, mostly Chinese. But I do remember a makeshift stall owned by an Indian uncle who sold goreng pisang and keledek sprinkled with pepper and salt for flavouring. Yum! The stubby Ipoh Bean Sprout says it all, arguably the best in Malaysia! have been following your blog for some time but never have the urge to commet until i saw this post. i grew up in buntong and still live nearby till today. the buntong wanton mee used to be good but not anymore. i have not been there for the past couple of years as the last few times i went, it was no longer good. the beef noodle located next to the demolished 'pat kok lau' used to occupied this liew fun stall in buntong. when it was in buntong it used to be good but now it's also no longer good. so much hoo ha on the falim beef noodles but i find it so so only. the lady who operate the stall used to work for the beef noodle store near 'pat kok lau'. if u r anywhere near falim, try out the yunnan 'cross bridge vermicelli'. it's good. it's somewhere near the crispy roast duck stall. it's not on the same row but the same batch of shop lot. the beef noodle is a steal! It cost us around RM 7 – 9 a bowl here in Penang. I like what you wrote. Very useful and interesting read! Sure like to visit this whole place which has so many to offer. Hahahahahahahaha…I will be the first one to jump off the building? Hehehehe…Jokin'…That is for Onn Kee@Lou Wong's Hor Fun lar…. Aiyo, you poor thing. Now that they have relocated, I don't think I know where to find them. Great to see my childhood Buntong Beef Noodles stall here..I thought they move out to near city centre a while ago, didn't know it's only a branch and the original is still around!! Can't wait to try it again when I'm back to Ipoh! The Travelling Foodie : Desa Rishah in Falim? OK, noted. thanks. SimpleGirl : i went on weekdays AND weekend. ouch, maybe they sensed me from afar and closed shop! foodbin : there's something darn smooth and addictive bout our hor fun eh? Christine : aiks, why? cz of that 'raw, green taste'? BBO : IF they're open for business, whenever that is. Anonymous : goreng pisang/keledek with pepper and salt?!! that's interesting. which part of buntong? worldwindows : true enough. but this one not the fattest though. sc : yeah, how true. maybe someday ppl can replicate those limestone water, and somehow grow fat bean sprouts even in erm, terengganu? amelie : thanks for following. the quality dropped? how come? tot they've been doing the same old routine since the olden days? I've tried the Qing Kee Yunnan Noodle, but havent got to blog bout it yet. a little bland in taste though, and i added a LOT of the sticky, addictive chilli oil. mimid3vils : wow, japanese buffet vs ayam tauge … go figure! ck lam : this small town of Buntong, never ceases to amaze. tng : yes we are! 🙂 degil eh? mboy : aiya, not everytime also soaked until all soggy one lah …. you can opt for the dry version ma. adel : not so sure if they're the original, according to amelie (comment above), the Sri Maju Buntong beef noodles in town WAS occupying this lot way back then. when i was young the owner made his wanton noodles manually. that was really good! and to those who r wondering if the beef noodles stall in buntong is original, the answer is 'no, they r not'. i have not try it myself. not original does not mean it is not good. moreover the original now located in town is no longer good, too saltish. as for qing kee yunnan noodle, i like it because it not saltish and not laced with loads of msg as most food are. amelie : hi amelie. yeah, coffee + cincau, or teh + cincau has been in most kopitiam's menu for some time now. those refurbished, modern kopitiams, of course. works wonders, as the cincau provides some texture to slurp on. Hi, yesterday went to Flame (Green Town) try the western. The price of the set dinner is reasonable. RM10.90++ included soup of the, main course, desert and drinks. the food portion is big, i had the chicken chop set, but dont take the BBQ source cause will spoil the taste of the chop. I would like to comment on the stalls that you mentioned up there. First of all on the “Buntong Bean Sprout Chicken”. I used to call it Fatty Bean Sprout Chicken because the person in-charge there used to be very fat. Food there considered good. Cannot compare with those days. Today, I believe it is still one of the best in Ipoh. As for the “Buntong Wan Tan Mee”, it used to be good because those days you can choose between pork wantan and shrimp wantan. Nowadays, you will only find one (1) type which is the mixture of pork and shrimp in their wantans. The noodle still reasonably good but please be there a bit early because that is when they add in the pork slice on your noodle. After they finished, they will only serve plain noodle. Inside the Buntong wet market, you will find a stall selling mixed pork porridge. It started at around 5 pm and close at 9 pm. Please don’t forget to add more of their chilli sauce. As for the “Buntong Mixed Beef Noodle”, no doubt it was very good when it was at Buntong. Now the fried wantans etc. still good. Just that it was commercialized and we don’t feel the specialty anymore. I see …. somehow, I still like Cowan Street’s. Though there were contradicting statements and views, when it comes to nga choy kai in Ipoh, Cowan Street’s the way to go. i should have insisted to try cowan street’s! No worries, still can try Cowan Street’s next time. Was wondering if there’s a halal bean sprout chicken that’s good. Hi, i have an obvious question to ask. Are the food serves here halal? all looks so yummy. I am born and raised in Buntong. Try the Penang Fried Kway Teow opposite the hawker centre in First Garden. The aunty has been frying there since before I was born and I’m 36!! Also the best Indian Fried Karipap, Goreng Pisang, Vadai etc at Conolly Road, the green stall.